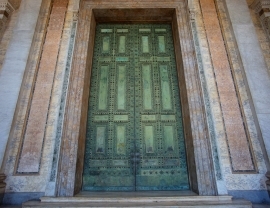 People don't know that, but through this door Emperors and patricians once walked into the Senate of the Roman Empire. Today it stands in the vestibule of the Papal Archbasilica of St. John in Lateran, the most important church of the entire Christianity. An astounding, breath-taking masterwork of art which alone is worth a visit to the Lateran complex. At the very heart of the power of ancient Rome was the Senate: the Curia Iulia which Ceasar built at the Forum. 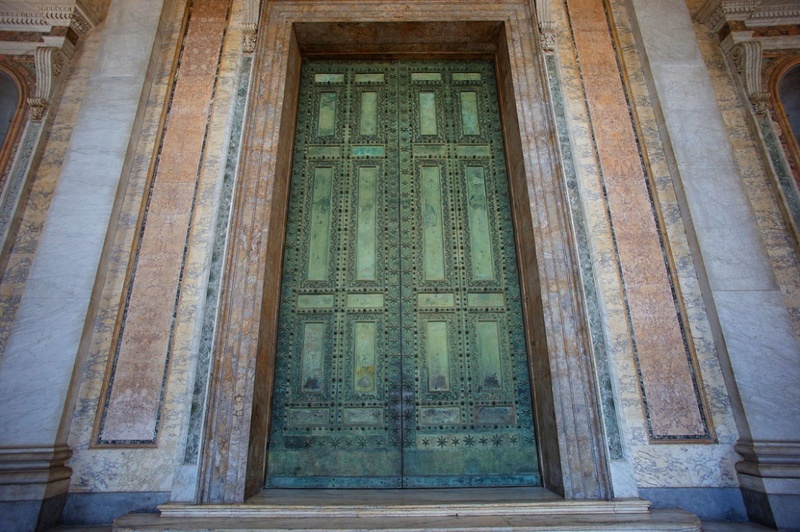 And giant bronze doors, a visible token of Rome's might, marked the entrance to the Senate. The huge gate saw the passage of the most illustrious senators and Roman rulers, fighting an endless strive for the control of the State and the supremacy over the outside world. 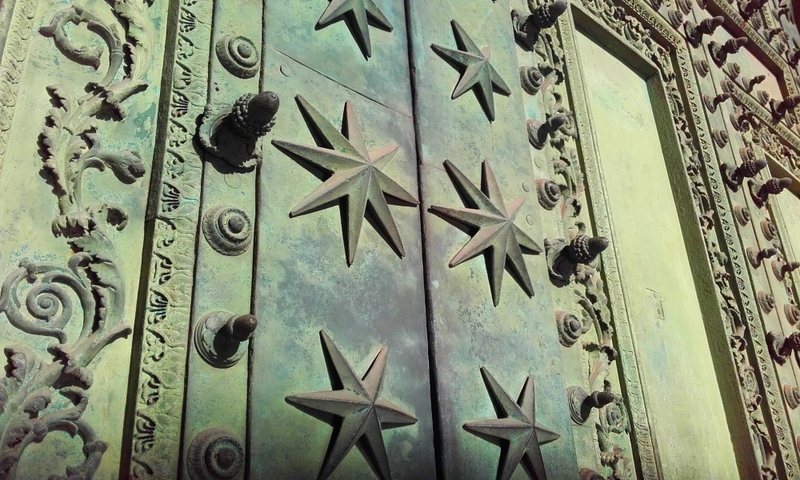 When in 1660 Pope Alexander VII Chigi entrusted Borromini with the task of transferring the bronze doors from the Curia to the Lateran Archbasilica, he wanted to reaffirm the prestigious lineage of the Church from the vanished Empire. 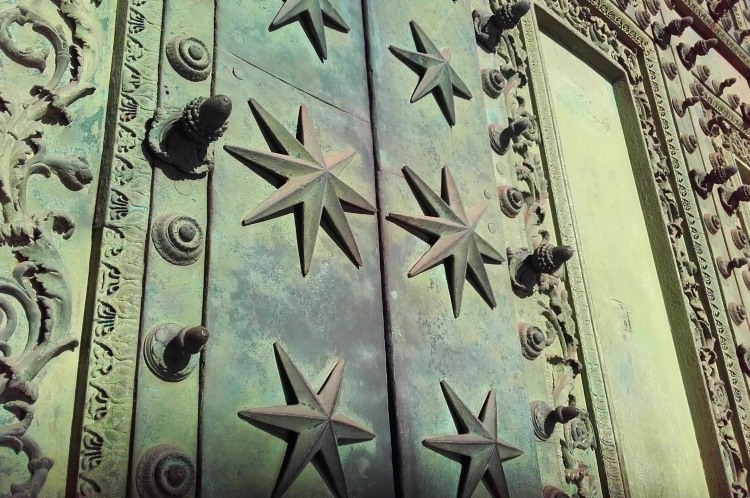 To the doors, originally made under Emperor Domitian and finely decorated with elaborate acanthus leaves and scrolls, the Pope added the arms of his family, the eight-pointed stars. So the impressive, magnificent gate still stands, even more beautiful than its kin at the Pantheon, and today we can still put our hand on the bronze surface to feel the subdued voices of a glorious history coming from a long-gone past. 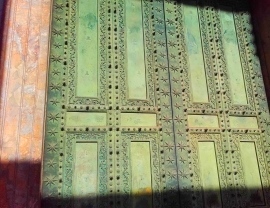 As you approach the church, two tall bronze doors as green as a patinated coin catch the eye. They are noble and heroic-looking doors which might have swung on brazen pivots in the palace of Priam. There is such venerable grandeur about them that I was not surprised to be told that they came from the Senate House. 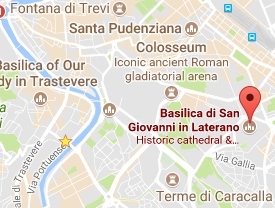 They were no doubt locked and barred when Alaric's Goths swepts into the Forum - I searched the green bronze for traces of hammers and axes - and they were still there when the Vandals came to Rome. They are among the most eloquent and impressive of relics. 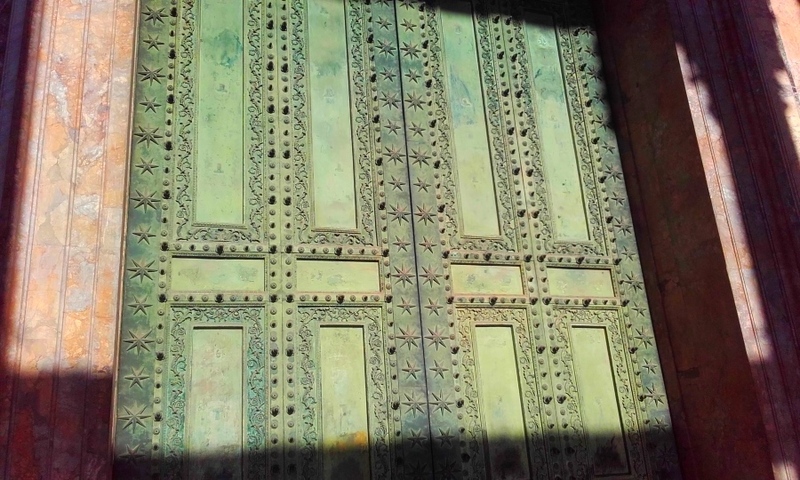 There must have been many such splendid doors, and all have now vanished except these.